Recently I’ve been getting back into my plugin writing. Anybody who writes or markets should in my eyes be able to code at least a little bit, and writing a WordPress Plugin can ease you into coding fairly easily. 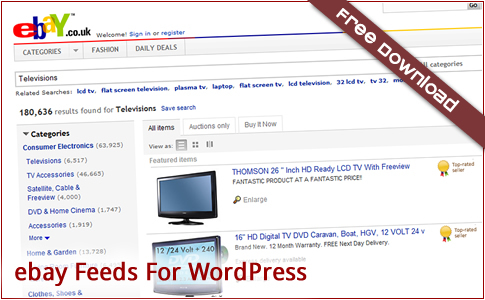 Anyway, my latest plugin – eBay Feeds For WordPress – has been released! The plugin takes eBay feeds created by eBay Partner Network and pastes them into your blog. It’s simple and fully customisable, allowing you to style the plugin via CSS. To download the plugin, please click the link below. To read more about customisation and how to install the plugin, check out the eBay Feeds For WordPress page. Any questions, please contact us on The Blogging Dojo’s new shiny contact page.